1923 was a crucial, momentous, and in some ways tragic year for the budding Missionary Society of Saint Columban. Conditions in China, including disease, bandit attacks, and political unrest were taking their toll on the Columbans in China, as were international political and economic troubles. Nonetheless, the Society was growing and positive steps were occurring. The most lasting of these was the purchase of the property at Silver Creek, New York, in the Buffalo area. Since mid-1923 the Columbans had discussed the possibility of buying land for a seminary on the East Coast of the U.S. to accommodate the growing number of students. The picturesque Silver Creek property on the shores of Lake Erie provided the ideal setting. 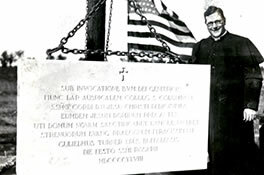 In May 1923 the Bishop of Buffalo granted Father Edward J. McCarthy and the Columbans permission to purchase the Silver Creek property, and they did so in late 1923. The Society was cementing and expanding its presence in the U.S.A.